As the food crisis increases around the world, it is necessary for us to reduce the amount of food we waste. 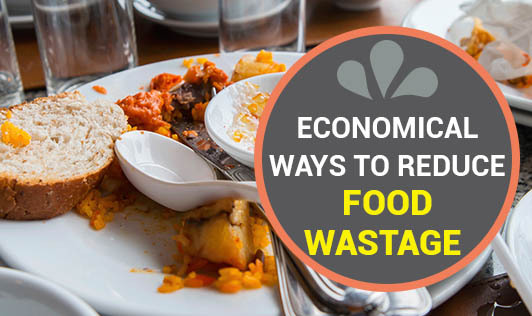 Through proper portion control and buying less perishable foods, we can minimize the food wastage. Simple tips are listed below to help you reduce the food waste and thereby this can save money and protect the environment. Write a list and check for the ingredients to stock your kitchen cupboards and refrigerator that help you plan the menu for a specified number of days or week. Don't get tempted by discounts and offers. Stick to the list you have planned before you go for purchase. Try to use the leftovers wisely. Do not throw it away when they still appear and taste fresh. Don't shop when you are hungry, as this can increase the number of unwanted items on purchase and you will end up making an unhealthy purchase. Rotate foods in your cupboards and fridge- after you get back home ensure that you put new foods at the back and old foods in the front that can help to prevent wastage. When you cook, always be thoughtful. If you consistently prepare more food than you need, get the help of your parents or elders on the portions to cook less. Freeze the food if there are any leftovers, and you can reheat them before consumption. Serve smaller portions on the platter. This is especially useful for children, as it is difficult for anyone to estimate on how much they can eat at once. When you can, donate non-perishable items and near expiry ones to your local charitable organizations, instead of throwing it away. Some food wastes, if unavoidable, use it for your household plants or garden as these can be valuable compost for the plants.